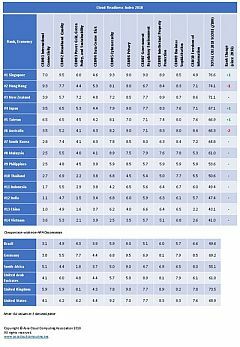 SINGAPORE, Apr 16, 2018 - (Media OutReach) - Mature Asia-Pacific (APAC) economies continue to top the Cloud Readiness Index (CRI) 2018 rankings. 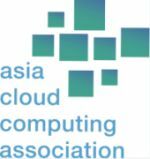 Developed by the Asia Cloud Computing Association (ACCA), the CRI places Singapore and Hong Kong ahead of much larger APAC markets such as China, India, and Indonesia. The CRI also reveals that the readiness divide observed in CRI 2016 has slightly widened despite emerging markets' efforts to leapfrog into digitally-enabled economies. If left unaddressed, this divide could lead to a pervasive unequal access to the potential socio-economic opportunities brought about by digital technologies. The difference between economies' CRI 2018 scores averages 2.7 points - just above the 2.6 of 2016 - which means the gap has slightly worsened over time. The fact that the eight highest ranking economies remain unchanged between the CRI 2014 and the CRI 2018 suggests that this cloud divide may already be deeply entrenched. Without further intervention, this divide could widen despite the efforts being made by emerging markets to leverage the smart technologies that enable sustainable digital economies. "To reduce the cloud computing divide, the ACCA recommends emerging APAC economies accelerate work to develop initiatives that boost connectivity fundamentals," says Eric Hui, Vice-Chair of the ACCA. "These could be government cloud (gCloud) schemes that improve international and domestic connectivity, as well as national digitisation plans that drive short-term technological innovation in emerging fields (5G, Internet of Things, Artificial Intelligence) and address longer term development goals." - India and China have both made significant progress in driving the region's adoption of cloud-driven technologies, playing central roles in the region's technological development. Yet at 12th and 13th positions respectively, they both remain at the bottom of the CRI rankings. - Indonesia, Malaysia, and the Philippines have recently implemented a number of forward-looking policies that make them attractive destinations for cloud providers. But because these are policy-driven changes, it will be some time before their impact can be felt or even measured. "The ACCA believes there is a clear need for additional metrics that measure the potential impact cloud technologies have on societies," says Lim May-Ann. "Should metrics be available across economies, a new Cloud Impact segment could be included in the CRI, involving a number of indicators such as number of smart cities, number of locally-developed apps, fintech presence and growth, attractiveness to tech start-ups, or IoT usage in industries." "Moving further into the Fourth Industrial Revolution, cloud-based technologies will continue to drive intelligent innovation that connects people, products, and platforms," adds Barbara Navarro, Treasurer of ACCA. "In this context, APAC economies must measure new aspects of their technology policies - not only their implementation, but also their actual impact on people's lives." Developed by the Asia Cloud Computing Association (ACCA), the Cloud Readiness Index (CRI) 2018 shows that Singapore's renowned no-nonsense efficiency is a powerful cloud readiness enabler. It is consistently positioned among the top three economies for most segments and parameters, taking top spot in this year's rankings. Significant improvements in Data Centre Risk, Cybersecurity, Data Privacy, and Intellectual Property Protection have pushed it up in those parameter rankings. It has also held on to its past rankings in many other parameters, consistently ranking among the top three economies. This demonstrates the power of strong, coordinated infrastructure and the benefits of flexible regulatory frameworks. Singapore's key weakness can be found in the aggregated Governance segment. A top Business Sophistication scorer, it is brought down by a poor Freedom of Information score. If it wants to continue succeeding, Singapore will have to ensure it balances the need for structured policies with sufficient space for innovation and experimentation. The CRI measures 14 economies across Asia Pacific on ten parameters to indicate how prepared they are in adopting cloud computing. Developed by the Asia Cloud Computing Association (ACCA), the Cloud Readiness Index (CRI) 2018 shows that Hong Kong loses its leading CRI position. Cloud Infrastructure remains one of Hong Kong's strengths, thanks to a strong performance in International Connectivity and Broadband Quality. Along with significant improvements in Cloud Security, Hong Kong clearly positions itself as a world-leading cloud computing destination. Its high score in the Data Centre Risk parameter also makes it an appealing data centre hub. But there is still room for improvement. Hong Kong ranks 5th in the aggregated Cloud Regulation and Governance segments, suggesting either not all aspects of its cloud strategy are solidly executed, or it is not keeping abreast of improving best practices. It has, for instance, lost some rank in three key Cloud Readiness parameters: Government Regulatory Environment, Freedom of Information, and Business Sophistication. The CRI measures 14 economies across Asia Pacific on ten parameters to indicate how prepared they are in adopting cloud computing. Developed by the Asia Cloud Computing Association (ACCA), the Cloud Readiness Index (CRI) 2018 shows that New Zealand has not moved from its 3rd position in CRI 2016. A regional leader, it is especially strong in the aggregated Governance, Regulation, and Infrastructure segments. Its highest marks are in the Power Grid, Green Policy, and Sustainability and the Business Sophistication parameters. To strengthen its position, New Zealand is developing a set of mandatory data breach reporting laws that will soon support its 'Cloud First' policy. A great overall ranking should not, however, distract from the fact that New Zealand's major weakness is the aggregated Cloud Security segment. It may perform well in the Data Centre Risk parameter, but the tumble to 8th in Cybersecurity hinders its ability to rise above its current position. If left to persist, this weakness may grow to dampen the progress already made in terms of cloud adoption. The CRI measures 14 economies across Asia Pacific on ten parameters to indicate how prepared they are in adopting cloud computing. Developed by the Asia Cloud Computing Association (ACCA), the Cloud Readiness Index (CRI) 2018 shows that Japan is one of three economies to have climbed one rank compared to CRI 2016. A decidedly mature economy, Japan's performance was at its best in the Regulation and Infrastructure segments. With its high internet speeds, reliable power supply, secure environment, and reliable regulatory frameworks, Japan is well positioned to lead regional cloud adoption. Its most notable improvement was in the Data Privacy parameter, reflecting recent legislative reforms such as the amendments to the Act on the Protection of Personal Information (APPI) and the establishment of the Personal Information Protection Commission (PPC) as a privacy commissioner. In most other parameters Japan remains stable with minor fluctuations in the mid-range rankings. Its most notable weakness was the dramatic fall in Business Sophistication rankings. It also experienced a precipitous fall to 9th rank in Business Sophistication, which may be explained by a tight clustering of scores in the Ease of Doing Business Index, combined with good performances from the mid-range economies. The CRI measures 14 economies across Asia Pacific on ten parameters to indicate how prepared they are in adopting cloud computing. Developed by the Asia Cloud Computing Association (ACCA), the Cloud Readiness Index (CRI) 2018 shows that Taiwan has made some encouraging progress on several cloud parameters, making it one of three economies to have climbed one position since CRI 2016. It rose to 3rd in International Connectivity and 4th in Cybersecurity. The Government Regulatory Environment and Freedom of Information parameters have also both improved. Cloud Governance and Infrastructure were Taiwan's best performing segments, which means the foundations are in place for cloud adoption to increase in the public and the private sectors. Taiwan's weakness is Cloud Regulation, mainly due to lower-than-usual scores for the Data Privacy and Intellectual Property Protection parameters. It has also slumped in the Data Centre Risk and Power Grid, Green Policy, and Sustainable Energy parameters. Taiwan can make considerable improvements in the next CRI by tackling gaps in its privacy legislation. The CRI measures 14 economies across Asia Pacific on ten parameters to indicate how prepared they are in adopting cloud computing. Developed by the Asia Cloud Computing Association (ACCA), the Cloud Readiness Index (CRI) 2018 shows that Australia's overall cloud readiness is weighed down by its relatively poor cloud infrastructure, leading it to lose two positions since CRI 2016. Despite this tumble, Australia remains a strong regional contender thanks to strong performances in key readiness areas. It continues to be a low-risk location to build data centres and it strongly protects intellectual property rights. Seeing a mature economy with a 'Cloud First' policy rank 7th in terms of Cloud Infrastructure may seem like a paradox, but it can be explained by Australia's unique topographical challenges. Its geographically large territory makes it difficult for businesses and governments to roll out large-scale, next-generation technologies - as evidenced by the stumbling roll-out of the National Broadband Network (NBN) since 2013. The CRI measures 14 economies across Asia Pacific on ten parameters to indicate how prepared they are in adopting cloud computing. Since 2011, the Cloud Readiness Index has measured the extent to which economies are prepared to adopt and roll out cloud computing technologies. The CRI is a composite index made up of 10 parameters grouped into four readiness segments - cloud infrastructure, cloud security, cloud regulation, and cloud governance - and measures where economies are in relation to each other. Scores are derived from secondary, publicly-sourced data and indexes, normalised to a 10-point scale using different statistical methods.